An ideal massage cream for any type of skin. Perfect for use by itself, or as an additional slip factor in combination for use with an ampoule. 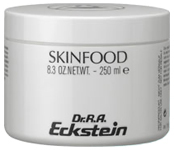 Skinfood is made of precious natural lipids and oils that easily penetrate the skin. The cream is extremely effective in protecting the skin from future dryness, and works to promote the immunity of the skin from infections. For use on face and body.